Take a trip down to the farm with lots of quacking, oinking, crowing and bleating fun as we meet chickens, ducks, pigs, roosters, lambs and of course…cows! 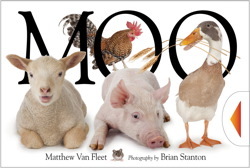 Moo is the latest interactive book from bestselling US author Matthew Van Fleet; following on from Cat, Dog, Alphabet and Heads. The format is very similar to Heads, with each page packed with colourful photographs and a rhyme focusing on a different farm animal. Mummy cow, Baby calf, Shaggy daddy bull. Moo cow, Milk the cow - grab the udder, pull! It is a robust book that is suitable for young fingers – the pages are thick and strong with pull tabs that are easy to grasp and move. Filled with farm animals of all shapes and sizes plus plenty of interactive and tactile elements, it’s hard to think of a young child that wouldn’t love this book. The rhymes are simple yet rhythmical which would also make it fun to read-aloud. Matthew Van Fleet is a New York Times bestselling author that has published several books for pre-school aged readers including: Dog, Cat, Tails and Alphabet. He lives with his family in upstate New York.